The way we see it, technology is such a colossal force for change and improvement, but technological innovation seems to have been slowest in the nonprofit space, an area where it undoubtedly has the greatest potential to meaningfully and immediately help underprivileged populations. With FoodFinder, we found a problem in need of solving and identified that new technology would be a welcome and relevant addition to the food assistance ecosystem, especially when the vast majority of food insecure families already use technology every day. FoodFinder is a registered 501(c)3 nonprofit organization whose mission is to be the most trusted way for food insecure families to find their closest free food, by making it as easy as it should be to get information on free food assistance quickly and privately. The program was originally developed to be used by two primary audiences: food insecure families in the public school system (K-12) and advocates of those families and their children (teachers, counselors, and social workers). We want to be the most trusted tool for those aiming to help others or help themselves by locating nearby food assistance programs. What FoodFinder does is collects and verifies information on food pantries, shelters, ministries, co-operatives, and emergency kitchens, and disseminates this information through online and mobile platforms. In order to give our users the clearest idea of when and where they can receive assistance, we include vital pieces of information on each free food provider, including (but not limited to) Street Address, Phone Number(s), Email(s), Hours of Operation, Languages Spoken, and Requirements to Receive Assistance. 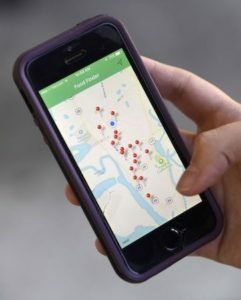 To quickly, easily, and privately offer this information, FoodFinder uses our own geo-locating website – https://foodfinder.us/ – and mobile apps (‘FoodFinder – Fighting Hunger’) available on both the App Store and Google Play. To date, FoodFinder has been used by more than 30,000 people in more than 1,000 different towns and cities in all 50 states; and the reason is simple – food insecure families no longer have to search for resources they don’t know about: FoodFinder automatically locates the user’s location and displays all of the closest free food sites nearby on one map. One click connects the user with the resources by phone, email, or gives step-by-step directions to get there by driving, walking, or taking public transportation. It’s an incredible honor to be a part of the Alliance to End Hunger. Massive problems like hunger need massive solutions. Coalitions and joint efforts such as the Alliance are the best approach to meaningfully and noticeably reduce food insecurity in America. In the same vein, hunger is a multi-faceted issue, so the solutions we pioneer should be multi-faceted as well. FoodFinder cannot wait to become acquainted with other members of the Alliance so we can use all means available to pave the way for a better future!